We are over the moon today! We are featuring a gorgeous card design by the very talented Heather Telford. She used the Altenew’s watercolor set and their Wonderland stamp and stencil set to create this beautiful design. The colors just pop over the paper and look so life-like! The vivid pinks and purples are amazing. Read how she did it, then pop over to her blog for more inspiration. Before I hand over the blog to Heather. I wanted to announce a GIVEAWAY. All you have to do to enter is comment on this blog or Heather’s (or both if you like) about your favorite flower. We are hoping this will encourage the flowers to start to bloom after a long winter! Heather and The Foiled Fox will be featuring our own floral designs along the way to keep you inspired. Hurry, get your comments in to have a chance to win one of the two $25 gift certificate from the Foiled Fox store. Hi there, I’m happy to be back with pretty new stamps from Altenew and a floral-themed giveaway with the Foiled Fox. I love flowers and you only have to look through my blog to see I love stamping them too! I haven’t done a count but I’m pretty sure flower cards might be the most common theme on my blog followed closely by tree cards. Today’s card features the ‘Wonderland’ stamp set and coordinating stencils from Altenew. I stamped the large poppy first in Versafine Clair nocturne ink on hot pressed watercolor paper then embossed in clear powder. 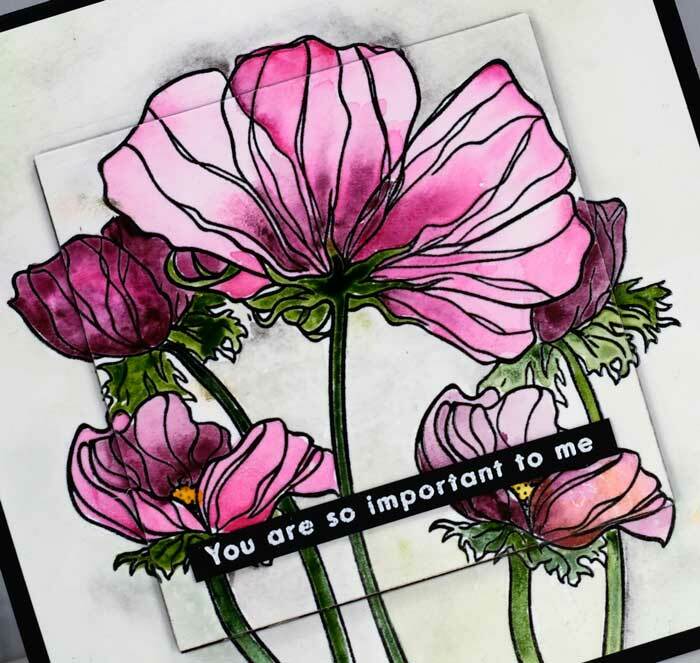 The coordinating stencil set includes the positive and negative pieces so I covered the stamped poppy with the stencil piece then stamped smaller poppy stamps either side and embossed. I really like have the stencil pieces to save me making a mask or doing partial stamping. Once the stamping was complete I chose some colors from the Altenew watercolor paint set. Because the paint set is made up of groups of colors that work together it is quite easy to choose a color scheme. I picked pinks that are side by side in the set, (a light, medium, and a dark) plus two greens. I started by painting with the lightest pink, blended in some of the darker pinks then let it dry a bit before adding more paint for extra depth and shadow. I added a tiny bit of yellow to a few flower centres too. To add a little bit of interest and texture to the background I painted around the poppies with water then dropped in some gray paint and blended it away to nothing with extra water. I dropped in some of the green of the leaves here and there too for variety. Before putting the card together I die cut a square from the centre of the panel and popped it up on a piece of black foam. The color scheme is quite dramatic so I settled on a black card base with a cream panel added inside to write on. The little sentiment is from the same set, stamped in black and embossed in white. You have probably noticed new floral stamps are all around right now. Maybe new flowers are also popping up where you are, not here in Ottawa though, I’m still surrounded by snow and ice! To celebrate the return of spring and flowers we are having a giveaway. To enter leave a comment here or on my blog telling us what your favorite flower is. I do love roses but the blue of cornflowers is so pretty and so is the shape of sweet peas and the delicacy of poppy petals…you get the idea. Your card is stunning. I love the contrast. I love my tiny grape hyacinth’s that emerge each spring before anyyelse decides to show its head. Absolutely stunning! The poppies look so real! Using the different sizes, the colors heather used, and popping up the center add dimension and reality. Masking with a stencil…perfect. If I received this card it would be framed. I can’t really decide on a favorite flower. I like wildflowers because the of the variety in shapes and colors! I love what you have done with this stamp set! I have been wanting it for so long! I love the colors you used and I love this stamp set. When I get it, I want to CASE your card! 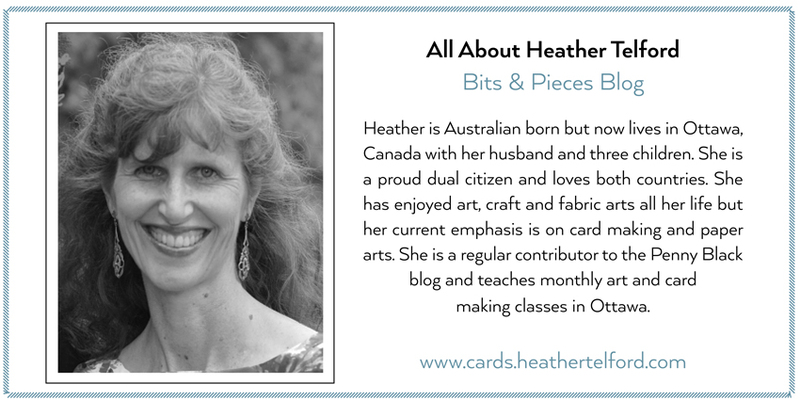 Heather, is one of my favourite bloggers as I am always so impressed with what she creates in your cards. I love the depth of colour in the poppies which make them look like they actually sink into the background, while the lighter coloured ones take centre stage. Just glorious! I am a lover of poppies, peonies & sweet peas. Thanks to you wonderful people at Foiled Fox for giving two people a chance to win. Wouldn’t I be more than happy! My favorite flower is the Tall Bearded Iris. They are low maintenance, available in almost every color, require little water and increase every year so there are plenty to share with friends. 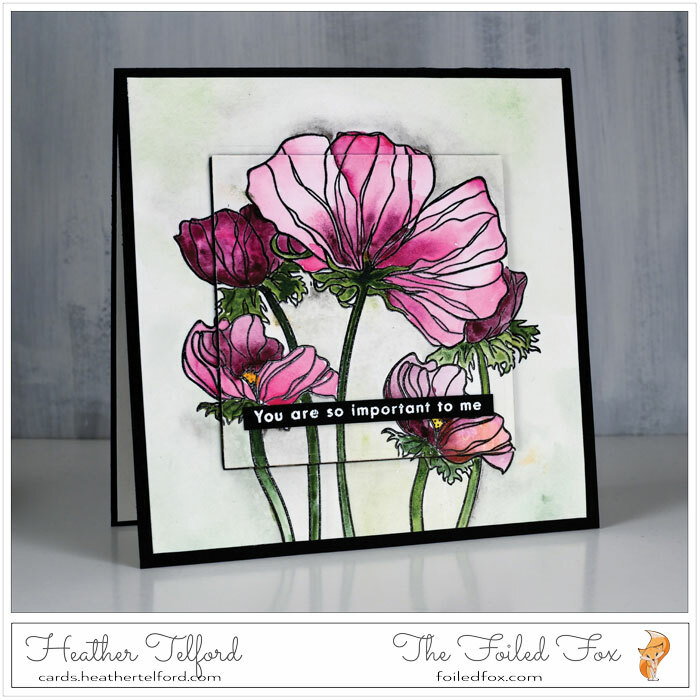 I really like Altenew’s Oriental Poppy image and Heather’s card is stunning. WOW! This is GORGEOUS! My favorite flower is the iris. This card is gorgeous! Even though the lilac is a tree, I adore it’s flowers. Whenever I see one I have to go over and deeply inhale it’s intoxicating scent. Yes, I have been know to pull over while driving for lilac sniff a time or two! I am instantly in a better mood after smelling these awesome wee flowers. Heather always creates such stunning cards! These poppies are gorgeous. I love to see the first crocus in my yard, but the smell of the hyacinth assures me that summer has come! Beautiful card!!! I’m a lover of wildflowers! Fields of wildflowers make me happy! I love all your flowers which fits right in with my being a gardener! But I think my favourite is the poppies. I love your purple tones. Have you seen the blue Himalayan poppy? I have not; but have been on the lookout since I read about it. I figured it might not be very happy with our Canadian winters anyways. Thanks for all your inspiration! Such a gorgeous card! Love the colors and dimension! My favorite flowers are sweet peas! I have such fond memories of picking them in our backyard with my Dad when I was a kid! Love the colors and fragrance! And I’m soaking some seeds to start them to plant in my yard this year! Beautiful card Heather! I appreciate the time it takes to put together a post. As for a favorite flower, I realized I’ve really not gotten one. I’ve received a love for them all from my Mom, Grandma & Great Grandma! I’d say dahlias, peonies lilacs and impatiens are among my favorites because of the above women. 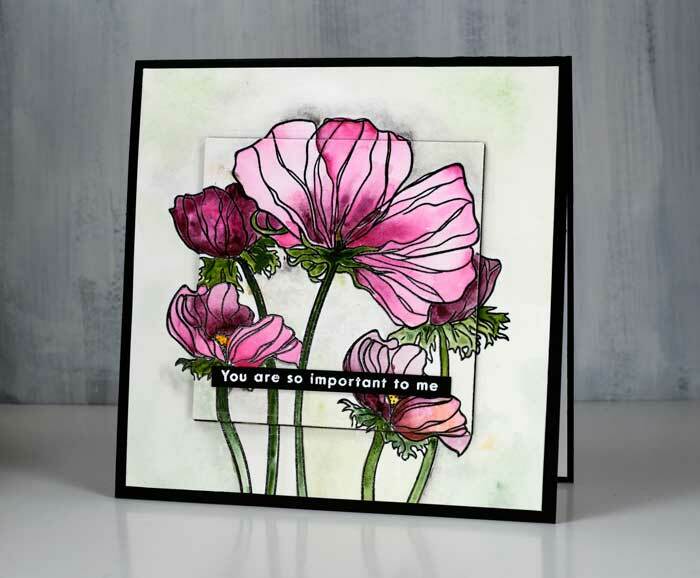 Your card is absolutely beautiful with these poppies! My favourite flowers are the bulbous begonias. Gorgeous and very talented. The bright colors are cheery saying Spring is on the way. These are lovely! My favorite flower is the hydrangea. I love how they are made of so many small clusters, and how the minerals in the ground affect their colors. What a gorgeous card, Heather! Love the beautiful poppies & the coloring! My favorite flowers are actually poppies, especially the tall ones that take over the garden & spread everywhere waving in the breeze! Oh, I hope this encourages more flowers to bloom. The card is stunning. And my favorite flower is the forget-me-not in blue or pink. Your card is beautiful! Love the colorimg! My favorite flower is the angel trumpet. The blooms hang upside down from the plant and have the most exotic scent at night. I’ve often wondered why the scent has not been reproduced in a perfume. Heather did such a gorgeous job creating her design. I do love carnations as they smell so nice and daisies. But all flowers are beautiful in my opinion. I like the delicate, pretty look of pansies. Thanks for sharing this beautiful card. Simply stunning! Love the layers and the gorgeous coloring! Such wonderful inspiratioN! You are right! It is hard to pick just ONE favorite flower 🙂 I suppose for me it depends on the season…pansies in the spring, geraniums in the summer, sunflowers come fall and anything that blooms in the winter! Your cards are beautiful, Heather! Your work is always inspiring. Peonies are my favorite flowers. I know summer is coming when I see their beautiful blooms. Heather’s watercoloring is always amazing to me. This card is stunning! Love the colors and design! My favorite flower is the rose. Heather’s watercoloring is always amazing to me. This is a gorgeous card- love the colors! My favorite flower is the rose. So beautiful. I love the popped up panel and the sentiment in white on black is so effective too. Your colouring is exquisite, as always. Much as I love vibrantly coloured flowers, my favourite flower is lily of the valley. My favorite flower is the poppy. Once had a dog named Poppy. I just love the card using the Bouquet Ballet stamp. The colors are beautiful. I love Heather’s watercoloring and her talent is amazing. It is always inspiring to see what she has done with a stamp set. My favorite flower is the daffodil since I am alway so anxious for spring! 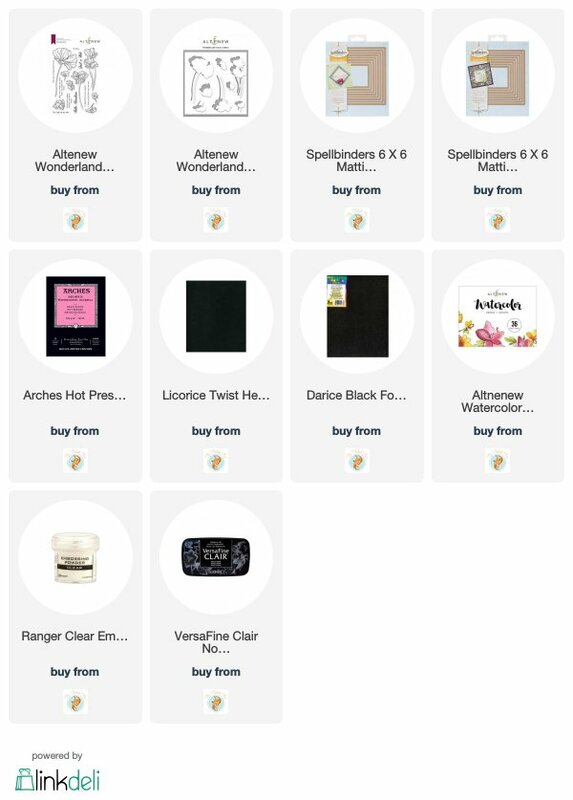 Thank you for this giveaway chance! I love the purples you used for these fantastical blooms. As for my favourite flowers, amongst so many beautiful blooms in this world, they would probably be Asian tree peonies – also ideally in lovely purples!! !